There are the keys to success, keys to the kingdom, keys to the city, keys to happiness, keys to riches, and even the key to the executives' men’s room. But, for Bert, KG2G, the key means only one thing, a tool to communicate using Morse code. Every ham has his thing, and clearly, Bert’s is collecting Morse code keys. 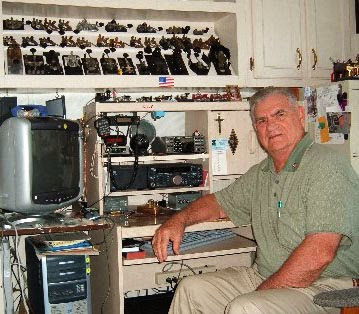 Bert is pictured above with part of his collection. While Bert would agree that keys are things of beauty, he is quick to point out that he also uses them. Voice is great, but there is nothing quite like communicating the ole fashion way with Morse code. For those reading this, who are not already licensed ham radio operators, I must point out that while sending and receiving code is still alive and well, it is no longer required to satisfy any Amateur Radio License. Code is a fun option, along with many other communication modes enjoyed by hams. Coming up, build a 20 meter for pennies.